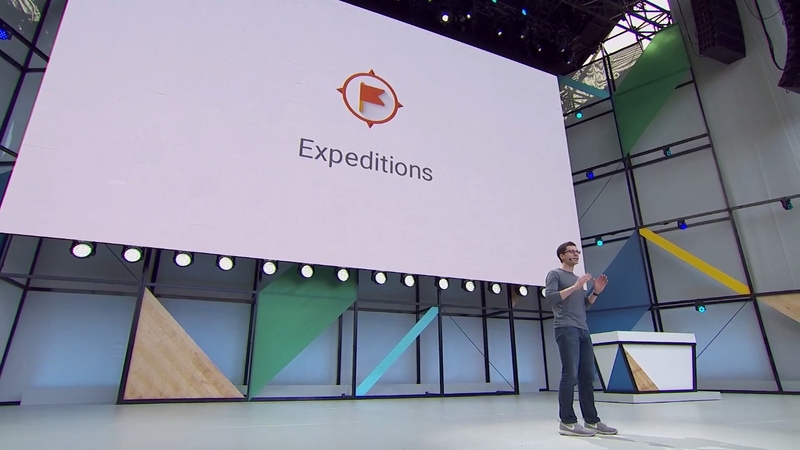 At I/O two years ago, Google introduced Expeditions, an educational tool allowing teachers to take their classes on virtual reality field trips, and it's since been experienced by more than 2 million students around the world. It could be used with an inexpensive viewer such as Google Cardboard to tour a variety of virtual spaces, such as Antarctica or the International Space Station. During this year's I/O keynote, Google's VP of Virtual Reality Clay Bavor announced a new feature for the app — it now includes an AR mode. By incorporating Project Tango technology, Expeditions is able to bring truly immersive content into the classroom. Students are able to engage with 3D objects augmented on top of their current surroundings, and it could be anything from a volcano to a strand of DNA. Check out the video below to see how it works in practice. The Expeditions AR mode will debut in schools later in the year as part of Google's Pioneer Program, which you can sign your school up to here. There will be more about what's next in both AR and VR at Google in tomorrow's I/O session.